Somehow it became November 2. Which means we are six days away from my 40th birthday! This is very exciting for me, for two reasons. Reason 1 – one of my closest friends is coming to visit! Michelle will be here for four full days. Which means at least 10 meals out. We have had an insane amount of conversations discussing where to go eat. Every now and then we discuss activities we can do too, but it’s really just as a way to kill time between meals. Reason 2 – I am excited about getting older. I know most people dread it, but not me. I am ready to move into an active adult community. I am going to take water aerobic classes, go to bingo, play Mah Jong, and eat in the dining hall at 4pm. I will get to all my activities in my hot pink golf cart. While wearing leisure suits and mumus (or however you spell it). It is going to be awesome. If I had been smarter I would have married someone at least 10 years older than me so I could get there sooner. And really be the young trophy wife that I strive to be. 🙂 Michael is barely two years older than me. Which means I am continuing to wait. And celebrating each year that gets me closer. Till I get to enjoy easy-to-chew foods in the dining hall, though, i have to keep cooking for myself. Yesterday morning I made bacon for breakfast, needing to some protein to counter act all the candy I snacked on the night before while trick or treating. And while I could have consumed the entire package for breakfast, I made an effort not to. Which meant leftover bacon to use with dinner. And I had some chicken that needed to get used as well. 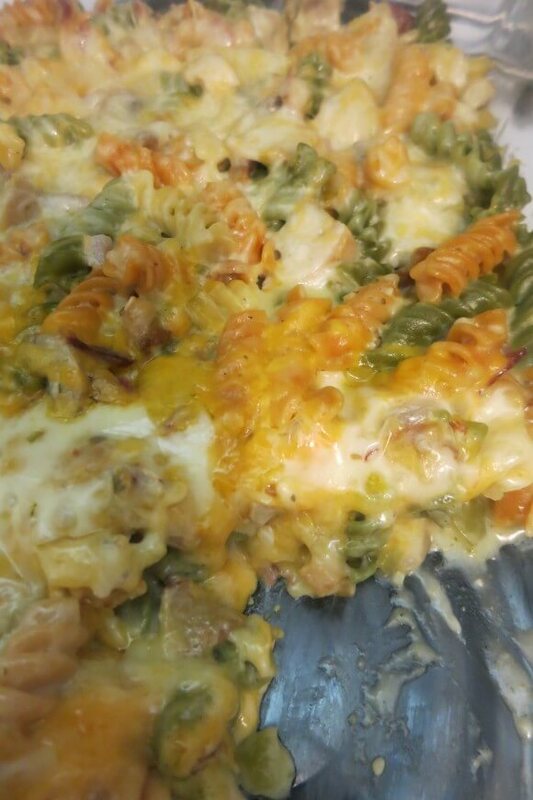 As always, I turned to Pinterest, where I found Bacon Ranch Chicken Casserole on the website Wheel and Deal Mama. Amazingly I had all the ingredients, although I did make some alterations. I added onion and mushrooms, cause you know, health. I also decreased the amount of ranch dressing and added in cilantro dressing in its place because I thought it would add a nice flavor to it. At 1/4 cup, it didn’t. So next time I’d do even more or I wouldn’t bother at all. And finally, I used pepper jack cheese on half of it instead of the Mexican blend to make it spicier. Prepare your bacon according to package. When done, let it cool then crumble and set it aside. Keep a small bit of bacon drippings in pan. Add garlic, butter, onion and mushrooms. Cook until butter is melted and onion is tender. Add in the chicken and flour and cook for one minute. Add in the milk and 3/4 cup of dressing. Mix over medium heat for 2-3 minutes, until slightly thickened. Remove from heat. Add in 1 cup of cheese. Stir till melted. Add in bacon and green chiles, and stir well. Add in noodles, and combine. Pour noodle mixture into casserole dish. 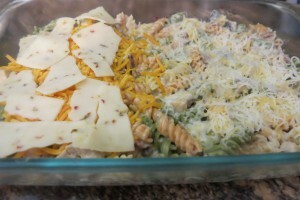 Sprinkle remaining cheese over top of casserole. Cook for 15 minutes until cheese is melted. Enjoy with a side of guacamole!